The OMEGA™ OM2 modular signal conditioning system provides a low cost, versatile method of interconnecting a variety of analog signals for measurement and control systems. The OM2 modules interface directly with sensors or analog signals such as strain gages, mV, thermocouples and RTD’s. The module conditions the input signal to an amplified voltage output of ±10 Vdc, allowing longer signal transmission and interfacing with data acquisition products such as analog/digital cards, dataloggers, PLC’s and chart recorders. The backplane includes a power supply (to power the modules) and mounting rails for convenient mounting capability. All connections are easily made with a screwdriver. The backplane is available with a 115 Vac, 230 Vac or 10-36 Vdc power supply. The backplane and signal conditioner assembly make a convenient, lightweight and accurate method of multiple signal conditioning in instrumentation environments. The signal conditioning modules can also be used by themselves as single amplifier devices. An optional interface mounting block can be purchased with screw terminations for easy power and output signal hookup. 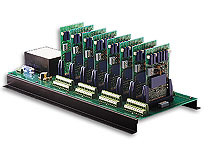 A typical system would include six modules and one backplane/power supply assembly. For complete product specifications see the detailed spec sheet.